Northeast New Jersey Christmas Tree Farms: choose-and-cut Christmas trees, Tree lots with pre-cut trees, stands, sleigh rides, hay rides and related winter events and fun! Whether you want to cut your own tree, pick a live tree and have it cut for you, buy a tree already cut or buy a living tree you can plant, this page provides detailed listings of Northeast New Jersey's choose-and-cut Christmas tree farms, places to buy pre-cut (also called pre-harvested and fresh-cut) trees, stands, sleigh rides, hay rides and related winter events and fun. Some listings are for tree farms, others are tree lots, and some only offer hay rides, sleigh rides or other winter events. READ EACH LISTING to know what each facility offers. The farms are listed further down this page, so scroll down the page! Since this service is free and open to ALL Christmas tree farms, not just those who belong to an association or pay for an ad, like almost all other websites do, this is the most complete and current listing available! I'm always looking for more to add, and to correct any inaccuracies or errors, so if you encounter any, please email me ! And please tell the farmer you visit in Northeast New Jersey that you found their farm here! I need the farmers to realize that you found them here so that they will keep their information up to date! 156 Summit Avenue, Montvale, NJ 07645. Phone: (201) 391-4576. Alternate Phone: (201) 930-8678. Fax: 201 391-6862. Email: depierosfarmstand@gmail.com. Open: Mid November thru Christmas Weekdays, Monday to Friday 8 am to 6 pm; Weekends, Saturday and Sunday 8 am to 6 pm. Directions: GSP North to exit 172, make a left onto Grand Avenue, make a right onto Chestnut Ridge Road, make a right onto Summit Avenue, make a right onto Craig Road, Family farm on left. Click here for a map and directions. Payment: Cash, Check, Debit cards, Visa/MasterCard, Discover, AmEx. Click here for our Facebook page. We have moved! Our new location: 156 Summit Avenue, Montvale, NJ 07645 Our family farm since 1924 will remain open everyday all year round. 168 Airmont Ave, Mahwah, NJ 07430. Phone: 201-529-2595. Open: Right after Thanksgiving we reopen 8 am to 6 pm Every Day April - June; Closed Monday and Tuesday during summer months (July - Aug); Secor Farms is closed during November, January, February and March. Directions: Click here for a map and directions. Raspberries- Please check our website about U-Pick Days; Raspberries: Late August and September. Payment: Cash, Check, Debit cards, Visa/MasterCard, Discover, AmEx. Come take a walk through a greenhouse bursting with colorful poinsettias and poinsettia baskets for the perfect holiday gift. Warm up inside our farm's market with a cup of hot chocolate and homemade apple cider donuts while you browse the holiday jams, cheeses and other assorted holiday treats. Get your cameras ready! Santa will be in his workshop for photos on select weekends from 1 pm to 4 pm. Hop aboard our winter hayride, which takes you to our fire pit where you can roast s'mores. Available select weekends on Saturdays and Sundays from 1 pm - 4 pm. Click here for a link to our Facebook page. In addition to our trees, we have a wide variety of decorated and undecorated wreaths, kissing balls and white pine roping to suit your decorating needs. Decorated grave covers and grave blankets are also available. Get your cameras ready! Santa will be in his workshop for photos on select weekends from 1 pm to 4 pm. Hop aboard our winter hayride, which takes you to our fire pit where you can roast s'mores. Available select weekends in December on Saturdays and Sundays from 1 pm to 4 pm. PreCut varieties: Balsam Fir, Blue Spruce, Douglas Fir, Fraser Fir. Living, rooted tree varieties: and other varieties (call!). 425 Powerville Road (pumpkins And Trees) 301 Rockaway Valley Road (Petting Farm and rides), Boonton Township, NJ 07005. Phone: 201 400 4505. Email: tina@brookhollowsbarnyard.com. Open: Saturday and Sunday from Thanksgiving week end to week end before Christmas, See our website for updated hours. Directions: Route 287 to exit 45. Turn onto Route 202 North(Myrtle Avenue). Turn left onto Taylortown Rd(Becomes Rockaway Valley Road in Boonton Twp). After 3 miles, turn left on Powerville Road at stop sign at four corners intersection. Shoppe at Brookhollow and farm is just ahead on right. Click here for a map and directions. . Payment: Cash, Visa/MasterCard, AmEx. "Cut your own Christmas tree" farm. After exerting all that energy finding and cutting your own tree, come watch Farmer Tina make fresh mini donuts. Tea, hot chocolate, coffee, delicious hot apple cider and donuts are available to purchase. The cold weather finds the petting farm closed; we send our animals on winter vacation to our nearby farm where they enjoy lots more space and a large warm barn. We, however, continue to work getting ready for our favorite time on the farm, the opening of our "Cut your own Christmas tree" farm.Please check our Facebook for dates and pricing. Click here for a link to our Facebook page. You-Choose and You-Cut varieties: Blue Spruce, Douglas Fir, Fraser Fir, White Fir (Concolor Fir), White Spruce. Hillside Ave & River Road, Chatham, NJ. Phone: 973-635-2097, Fax 973-635-9028. Open: 9 am to 3:30 (Friday, Saturday and Sunday), Saturday after Thanksgiving to December 24. Directions: Rte. 24 to Rte. 124 to Chatham to S. on Hillside Ave. (at Exxon Station), farm 1 and 1/2 miles (7 min. from Short Hills Mall). Bring the entire family for an old fashion holiday experience. Don't forget your camera! Wander our 10 lush acres, find the perfect tree, check the height and make your final selection. Cut it yourself, we'll show you how, or let us cut it for you. Either way, you know it's fresh! Finally, we'll help you secure it for the ride home so you can enjoy it for the entire holiday season. While you're here, don't forget to visit Chatham's quaint Main Street for breakfast, lunch or a cup of hot cocoa. We are less than an hour west of NYC, so you can make a day of it and easily still be home in time for your evening dinner plans. Click here for a link to our Facebook page. U-Choose & Cut your own: Norway Spruce, Douglas-fir. 55 Kings Highway, Long Valley, NJ 07853. Phone: 908-852-6996. Fax: 908-852-3040. Email: Kevin@FlemingFarms.com. Open: Please call ahead if you are a past customer and we will help out the best we can ... we are not planning to open to the public this year ; (we are still waiting for about 1,500 new trees to grow up), There are still some larger trees this year (12' to 20'). Click here for current open hours, days and dates. Directions: Click here for a map and directions. Crops are usually available in December. Open: Payment: Cash, Check. We also have a tree drilling machine for use with the pin stands. Call Kevin on his cell phone at 201-230-3537 if you need immediate assistance and there is no answer in the office. He is probably out with the trees! Thank You. You-Choose and You-Cut varieties: Blue Spruce, Douglas Fir. You Choose and We cut varieties: Blue Spruce, Douglas Fir. Comments from a visitor on November 24, 2010: "LAst year, I visited Fleming Farms with my family and I was very dissapointed. Eventhough the people were very nice and helpful, it was not what I expected. And the worst part of all, the tree we purchased had nasty little bugs. It was very upset! Base on our experience I would not recommend this cut your own tree farm. " 312 Naughright Road, Long Valley, NJ 07853. Phone: 908-850-1483. Email: AGranata63@comcast.net. Open: 7 am-6pm Monday through Saturday. Sunday scheduled appointments are welcome Closed for all Roman Catholic Holidays. . Directions: Call for directions. Payment: Cash, Check . This farm is on 8 acres. It is family owned therefore the farm is also the residence of the owners. There are pre cut christmas trees to select, as well as 8 acres of land filled with trees you can watch get cut down. Employees wrap and tie tree to your car for you. Comments from a visitor on October 02, 2011: "Very friendly, nice people. Plants are very healthy and christmas trees last a very long time with minimal maintenance. The owners are very welcoming and friendly. Their traditional Sicilian hospitality are shared with all customers. Not only is this a christmas tree farm, but it is a landscaping company of great talent. All are welcome to choose a tree here yourselves in the winter, of all breeds and sizes. In the summer you are welcome to come choose trees and other plants to insert in your yard. " 130 Old Denville Road, Boonton Township, NJ 07005. Phone: 937-334-6528. Email: info@hamiltonfarms.com. Open: Monday thru Saturday 9 am to 6 pm and Sunday 9 am to 5 pm November hours are Monday thru Sunday 9 am to 5 pm. Directions: Click here for a map and directions. Payment: Cash, Debit cards, Visa/MasterCard, Discover. Click here for our Facebook page. Wooden train, ship and bus play structures for year round play when patronizing our facility. Farm Fresh free range Turkeys available by special order for Thanksgiving and Christmas. Farm fresh free range turkeys and spiral ham are available by special order. Come out and shop rain, snow, or shine as our Christmas Trees are displayed in the greenhouse which allows you to fully inspect your special individual selection. West Field Road, Mendham, NJ 07945. Phone: 973-865-6362. Email: cnicho6345@aol.com. Open: the Season opens the day after Thanksgiving (Friday) and the farm will be open daily from 9 am to 5 pm, except we are closed on Mondays. Directions: Tree farm is located at the end of West Field Road in Mendham NJ 07945 and 1/2 mile west of town center off of Route 24/West Main Street 1/2 mile west of the Black Horse Inn restaurant, a local landmark. Click here for our map and directions or Click here for a Mapquest map and directions. Crops are usually available in December. Payment: Cash, Check. Come and visit one of the nicest choose and cut family owned farms in North Jersey. Cut your own Norway or Blue Spruce up to 12' tall. Pre-cut Douglas fir up to 15' cut daily. Free hot chocolate and hay rides for the whole family. Come see us for an old fashioned "great day at the farm". Home of the 2009 NJ Grand Champion Christmas Tree. We follow organic practices but are not seeking certification. Dog friendly farm. CUT YOUR OWN Live Spruce up to 7 Ft. PRE-HARVESTED Fresh Fraser Fir up to 12 Ft. Free Hot Chocolate & Hayrides. We're Dog-Friendly. Local Food. You-Choose and You-Cut varieties: Blue Spruce, Norway Spruce. You Choose and We cut varieties: Colorado Blue Spruce, Norway Spruce. PreCut varieties: Douglas Fir, Fraser Fir. Comments from a visitor on December 02, 2013: "We take our family to this farm every year, and it is always a great experience. We were there this past weekend, even though they were low on the cut your own supply, we got one of their Fraser Fir which was just freshly cut from their other farm. It is always a magical experience as there are hayrides, roasting of marshmallows and hot cocoa. Everything is free but the tree. I don't know how this family affords to offer all of this at no cost but they pull it off every year. A true family operation and an awesome experience for our family. HIGHLY RECOMMENDED especially for those with young children. " Comments from a visitor on December 11, 2011: "was very disappointed overall. not a great selection......very, very overpriced...website not at all what was there....no hayrides....only 1 or 2 types of trees....deceiving site had a very hard time even finding a tree that wasn't either a charlie brown tree or 15 feet tall. worst tree farm in 10 years.....ruined our whole experience"
Comments from a visitor on November 28, 2009: " All trees are well groomed and spaced. Provided are plenty of quality saws. Cut your tree and have a driver deliver to the packaging area while you ride in their wagon. Friendly folks are great to kids. Two tag price ranges yellow $65 and red $95. Pricey but really full healthy trees. Gave accurate info when we called." 132 Western Avenue, Morristown, NJ 07960. Phone: (862) 345-7003. Email: trees@hillsidehose.org. Open: Beginning the Friday after Thanksgiving through December 24th, Monday to Friday, from 3 pm to 9 pm; Saturday, from 10 am to 9 pm; Sunday, from 10 am to 5 pm. Click here for current open hours, days and dates. Directions: Click here for a map and directions. Payment: Cash, Check, major credit cards. Click here for our Facebook page. Tree sales begin the day after Thanksgiving and end on December 24th (or when we sell all of our trees). Hillside also carries wreaths in a variety of sizes from 12 inch to 36 inch, both decorated and plain. And garland in lengths from 18 feet to 75 feet. . Grave Blankets - We carry two sizes of grave blankets. 25 Bartley Road, Long Valley, NJ 07853. Phone: 908-876-3351. Email: nicole@ortfarmsnj.com. Open: December 1st - 31st. Directions: Route 80 W to Exit 27A, Route 206 S to 1st light after McDonalds, Right on Bartley-Chester Road. 1 mile 1st left on Bartley Road 3 miles on Right. Click here for a map and directions. Payment: Cash, Check, Debit cards, Visa/MasterCard, Discover. Click here for our Facebook page. Ort Farms is the place to find all of your holiday decorations. We are open until December 24th for the Winter Season. Our road stand has a wide variety of Christmas decorations and holiday products. We have pre-cut Christmas trees with 3 different varieties: Frazier Fir, Douglas Fir and Balsam. We also have potted live trees.Our Christmas elves come in Late November and begin hand decorating wreaths, centerpeices, grave covers, crosses, swags, kissing balls and more. (Various sizes 6-12 ft.), Wreathes - plain & decorated. Kissing Balls, Roping, Designer Bows. PreCut varieties: Douglas Fir, Fraser Fir, and other varieties (call!). 220 Flocktown Road, Long Valley, NJ. Phone: 908-852-6669. Email: plutschristmastreefarm@gmail.com. Open: tagging on the 1st weekend in October (Saturday and Sunday from 8 am to dusk), then cutting starting on Friday after Thanksgiving, and then Thursday to Sunday from 8 am to dusk (around 4 pm), closed Monday to Wednesday. Directions: Rte. 80 W, Exit 26, 7 traffic lights, left at Exxon onto Naughtright Road approximately 3 and a half miles make left onto Flocktown Road. Farm is 8th driveway on left. From Rte. 287N, exit onto 206N, continue to Chester, make left onto Rte. 24 at Turkey Farm -, continue into center of Long Valley. At light, make right, over stone bridge, go up mountain, pass Our Lady of the Mountain Church on rt., Schooley's Mt. Fire Dept. on left. 100 yds. after General Store, make right onto Flocktown Road (at Eagle). approximately 3 miles go thru stop sign. Farm is 8th driveway on left. Come find your tree from our diverse acres of fields and pre-cut selection! Enjoy concessions including hot-cocoa, cider, corn dogs, and homemade funnel cakes. Finish by shopping our Gift Shop and Wreath Shop for hand made custom wreaths, canes, kissing balls and more! No saws required. Our staff will cut and drag your tree for you as well as bail and tie your tree to your car. Comments from a visitor on December 05, 2010: "We have been cutting our trees for over 20 years and this was our best experience!! The selection of trees was amazing with many, more to come. The people were patient--we picked out 3 trees, they CUT our tree, wrapped it and would have tied it to our vehicle using their expertise. But, I think my kids loved the funnel cake and corn dogs best!!! Thank you for this site!! I just had to rave about the Pluts!!"
. Directions: Click here for a map and directions. Payment: Cash, Check. . Click here for a link to our Facebook page. Come visit us on our 9 acre Christmas Tree Farm located on the Raritan River. All our trees are grown on premise at . Dogs/pets are welcome! At Ralston Nurseries, you can cut the tree yourself or someone can help you. You-Choose and You-Cut varieties: Norway Spruce. You Choose and We cut varieties: Norway Spruce. U-Choose and Cut varieties: Blue Spruce, Norway Spruce, White Spruce. You Choose and We cut varieties: Blue Spruce, Norway Spruce, White Spruce. 76 River Road, Montville, NJ 07045. Phone: 973-299-1784. Alternate Phone: 973-879-5571. Email: s2906@aol.com. Open: We are only open October, but you can order a christmas tree through our website and/or contact information, we will take an order, go to Pennsylvan Saturday, cut down the tree ourselves, have it wrapped and delivered to your house for one flat fee. Click here for current open hours, days and dates. Directions: 287 South-Take exit 47 for US-202 toward Montville/Lincoln Park. Turn left onto US-202 S/Main Rd, continue on River Road, farm stand will be on left. 287 North-Take exit for US-202S and turn right, continue onto River Road, farm stand will be on left. We use natural practices, but are not seeking organic certification. Payment: Cash, Check. 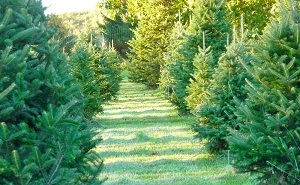 PreCut varieties: Blue Spruce, Douglas Fir, Fraser Fir, and other varieties (call!). PreCut varieties: Balsam Fir, Canaan Fir, White Fir (Concolor Fir), Douglas Fir, Fraser Fir. Meyersville Road, Green Village, NJ. Phone: 973-984-8425 (also 908-236-9202). Directions: I-287 Exit 33 - Take Harter Road East 1/10 mile Right on James St. for 1 mi., straight on Featherbed Lane 6/10 mile - Left on Village Road. 1.2 miles Right on Spring Valley Road. First right on Meyersville Road to farm sign. Open: 10 am to 3 pm (Saturday and Sunday), Saturday after Thanksgiving to December 17 (Except 10 am to 1 pm on December 18). Click here for a link to our Facebook page. 2) Choose and Cut Tree Service- You choose the tree you like and you may or we will cut it down for you! We provide measuring sticks and saws to make the job a lot easier! 3) Roof tie down service- Our staff will be more then happy to tie your tree to your car to ensure it gets home safely! 6) Lets not forget this is a big exciting day for the kids so to make the day even more fun for them we offer hay rides pulled by an antique tractor, cookies, candy canes and while supplies last a free coloring book! This year we will also be offering photography service where your pets and children can have their picture taken with two of Santa's Reindeer! U-Choose & Cut your own: Blue Spruce, Norway Spruce, Douglas-fir, Concolor Fir, Fraser Fir, Scotch Pine. Route 202, 1111 Mt. Kemble Avenue, Morristown, NJ. Phone: 973-425-9819; Hotline: (973) 425-0840. Email: wightmansfarms@yahoo.com. Open: Market: Daily, year-round except Christmas, 8 am to 6 pm. Directions: I-287 to Exit 30B, right at light, 1/3 mile on left; S on Route 202 from Morristown; N on Route 202 from Bernardsville. hardy mums; perennials; Easter flowers; dried flowers, fresh bouquets; apple cider; gourmet foods; honey; maple syrup; birdhouses & feeders; bird seed; hickory-smoked meats; cheeses; deli meats; home-made salads; bakery (pies, donuts, muffins, cookies, brownies). You-Choose and You-Cut varieties: Balsam Fir, Blue Spruce, Eastern White Pine, Norway Spruce, Scotch Pine, White Pine, White Spruce, and other varieties (call!). 118 Bunker Hill Road, Griggstown/Franklin Twp, NJ. Phone: 732-306-4265. Directions: Route 1 to New Road to Bunker Hill Road (approx 2 miles off of Route 1); Click here for directions. Open: 9 am to 4 (Saturday and Sunday), December 9 to December 24. Bunker Hill offers a variety of Christmas trees: Douglas Fir; Blue Spruce; Concolor Fir; Norway Spruce; and Premium Fraser Fir. We also offer grave blankets and Christmas wreaths. Choose 'n cut, or we can assist you! 334 Skillmans Lane, Somerset, NJ 08873. Email: circellitreefarm@gmail.com. Phone: 732-873-3757. Open: Call for for hours and availability. Directions: Call for directions. Payment: Cash, only.. Cut your own Christmas trees. We also have pre-cut trees, wreaths, & grave blankets! Comments from a visitor on November 22, 2014: "Nice selection, very friendly people. Bought our tree there last year (2013). Will go back there again this year." 4 Todd Ave, Peapack, NJ 07977. Phone: 908-781-5407. Email: DowerFarm@gmail.com. Open: the 4 weekends before Christmas, Saturday and Sunday, from 10 am to 4 pm; weekdays and rest of the year by appointment which can be made by calling the farm. Click here for current open hours, days and dates. Directions: Take route 206 to Peapack. Follow Main street to Todd avenue. Follow Todd avenue to top of the hill where two white gateposts mark the entrance to the farm. Click here for a map and directions. Payment: Cash, Check. Click here for our Facebook page. Welcome to the Dower Farm! For over 40 years friends and families have come from far and wide to choose and cut their Christmas Tree in Peapack. Not only is this a great way to get in the Christmas spirit, but by coming to our farm you support the movement to keep land open and free from development so it can be enjoyed by generations to come. See our website ! (click on the blue name of our farm above - it is a link to our website. Upon arrival you will set off into the field to select your tree. We provide each customer with a bow saw and twine to secure your tree for the ride home. Gloves to carry your tree are highly suggested, and warm clothing as it could be snowy and cold.We are mainly selling Canaan firs and Norway Spruces, of which we have 800-1,000 between 4-9ft high. Remember, the trees look a lot larger in the tree stand in your living room! You-Choose and You-Cut varieties: Canaan Fir, and other varieties (call!). 277 Bennetts Lane, Somerset, NJ 08873. Phone: 732-545-9243. Email: ZboJim@aol.com. Directions: Rt. 287 to Easton Avenue Exit toward New Brunswick. approximately 3 mi to JFK Blvd. approximately 3 and a half miles on JFK Blvd. (changes to Clyde Road) to Bennetts Lane, Turn right on Bennetts Lane and proceed 1/10 mile to farm on left. Watch for green Christmas Tree signs. OR Rte. 1 to Cozzens Lane to Rte. 27N to first light. Left on Bennetts Lane, then 1.3 miles and left to remain on Bennetts Lane, After turn, farm is on left 1/10 mile. And for a map to our farm, click here. Crops are usually available in December. Open: Friday, Saturday and Sunday from 9 to 5; Or call or email for mid-week hours. ; Open for Christmas trees from November 30 through December 21. Payment: Cash, Check. Grave cross blankets also. Please order by phone or e-mail. You Choose and We cut varieties: Balsam Fir, Blue Spruce, Canaan Fir, Colorado Blue Spruce, Douglas Fir, Scotch Pine, and other varieties (call!). 404 Skillman Road, Skillman, NJ 08558Alternate Phone: 1 609 466 0947. Email: parisofarm@gmail.com. Open: Saturdays and Sundays 9 am to 3 pm (arrive by 3 pm, allowing enough daylight time for a wander about to find that perfect tree); We are open every weekend beginning after Thanksgiving. Directions: We are located in Montgomery Township providing easy access from any direction. Once you get yourself nearby, the local directions are to take Route 601. When are the traffic light intersection with the Skillman Post Office, you turn onto Skillman Road (towards the High Schools back entrance) and go across the railroad bridge. We are the second drive on the right, just after the bridge. If you pass Fairview Road, you went too far. Click here for a map and directions. Payment: Cash, only. We can not say we are organic, however we attempt to minimize the use of 'chemicals and pesticides'. We have NOT used the preceding for three growing seasons. We pride ourselves in being a family run business, where you and your family may enjoy a day out in the country, away from the blaring of holiday tunes and the crowds of holiday shoppers. We welcome dogs, but please bring a leash (if we are busy we will ask you use the leash). If you want to pack a lunch and make a day of it, absolutely fine with us!. You-Choose and You-Cut varieties: Blue Spruce, White Fir (Concolor Fir), Douglas Fir, Fraser Fir, Norway Spruce, White Pine. 213 Grandview Road, Skillman, NJ. Phone: 609-466-3596. Open: 9 am to 5 pm (Saturday and Sunday), Our 2017 choose and cut season begins Saturday December 2nnd; Saturdays and Sundays only during December. Directions: Rte. 518 E. or W. to Rte. 601 North. approximately 2 miles make left onto Grandview Road (Johnson & Johnson sign) proceed 1 mile to top of hill. Driveway on left. U-Choose & Cut your own: Norway Spruce, Douglas-fir, Concolor Fir. 1803 Route 27 on the Corner of Skillman's Lane, Somerset, NJ 08873. Phone: 732-846-7139. Fax: 732-846-6542. Email: suydamfarms@aol.com. Open: Every Saturday and Sunday till Christmas; 9 am to 5 pm. Directions: Corner of Skillman's Lane and Route 27. 1 and 1/2 miles from Route One near Cozzens Lane. 4 miles south of New Brunswick and 10 North of Princeton. And for a map to our farm, click here. Crops are usually available in September, October, December. Payment: Cash, Check. We have carriage rides to the tree fields, where you can spend as long as you wish choosing the perfect Christmas Tree. Once you make your decision, you can cut it or one of our staff will be happy to cut it for you and assist you in carrying it back to your vehicle and securing it. A memorable Christmas tree experience can be yours when you visit Suydam Farms to cut your own! We also have fresh cut trees if you prefer. Choose and cut your Christmas tree from over 6 acres plus fragrant custom wreaths. You-Choose and You-Cut varieties: Blue Spruce, Douglas Fir, Norway Spruce. PreCut varieties: White Fir (Concolor Fir), Douglas Fir, Fraser Fir. 176 Bennetts Lane, Somerset, NJ. Phone: 732-873-3206. Email: info@WolgastTreeFarm.com. Open: 9 am to 5 pm (Saturday and Sunday), Weekdays by appointment; December 2 to 23. Directions: I-287 to Exit 10 - to Easton Ave. - right on JFK Blvd. (becomes Clyde Road and then Bennetts Lane) - 2 and 1/2 miles to farm; At Rtes. 1 and 130 - Rte. 1 S. 2.2 miles - right on Cozzens La. - right on Rte. 27 - left at 1st right (Bennetts La. ), farm 1 mile. We're proud that our Christmas Tree farm is still very much a "Mom & Pop" operation. We enjoy meeting people & assisting them with their special Christmas Tree. We will gladly cut, carry and help you secure your tree to your vehicle; so that you can go home and get your tree up and enjoy knowing your Christmas Tree came from a real Christmas Tree farm. U-Choose & Cut your own: Norway Spruce, White Pine, Douglas-fir, Canaan Fir. 1325 Terrill Road, Scotch Plains, NJ 07076. Phone: 908-322-5555. Fax: 908-322-4818. Email: parkergardens@parkerplants.com. Open: PARKER GARDENS IS CURRENTLY CLOSED; After over 65 years servicing the gardening needs of the community, Parker is closing its garden center operation at their Terrill Road location; However, they will continue to run the other Parker companies at this location as usual. Directions: 2 and 1/4 mile south of Route 22 at the Sears store on Terrill Road We are on the left in Scotch Plains. And for a map to our farm, click here. 524 Springfield Ave, Westfield, NJ 07090. Phone: 908-232-4076. Fax: 908-232-0079. Email us at: dave@williamsnursery.com. Open: See their website. Directions: And for a map to our farm, Click here. Our products are usually available in November and December. Payment: Cash, Check, Visa/MasterCard, AmEx. PreCut varieties: Balsam Fir, Canaan Fir, Concolor Fir (White Fir), Douglas Fir, Fraser Fir, Grand Fir, Noble Fir, White Fir (Concolor Fir).